After nearly 3 weeks of traveling and meeting many Muslims and Evangelical Christians from literally all over the world at international conferences on peace-building, our 2F1F Team member was deeply inspired by the great work many are doing, but also even more aware of the need for this worldwide. No matter what country people were coming from, I heard stories of racism, fear of immigrants, a dislike of what is happening in the political realm, and growing tensions between people from different ethnicities, social status, and religions. For example, a young man from Burundi told me about ongoing tension between Hutus and Tutsis. Indonesian students told me about the use of extreme violence by police and street gangs. A Japanese friend told me about the rise of a political party in her country that pushes fear of immigrants coming from other Asian countries. A girl I met from South Africa shared with me that Apartheid may be gone legally, but racism is still alive and even growing. More specifically when talking about Muslim-Christian relations, I found that everywhere in the world where you find people of both faiths, there are signs of fear, suspicion, lack of interaction, apathy, tension, and in some cases violence. An Ethiopian woman told me about the outward respect, but inward suspicion between Muslims and Christians in her country. A guy from Palestine told me that in some villages Muslims live on one side of the street and Christians on the other and there is no interaction between the two. A man from Nigeria told me about the growth of Muslim and Christian militia that take up arms against each other. People everywhere are encouraged by the stories of Muslim-Christian peace-building anywhere. The fear and negative views of Muslims is something I found among evangelicals I met from all over the world. However, as soon as I tell stories about the 2F1F movement, hearts and minds change. One guy from Mexico said: “I had no idea positive interactions between Muslims and Christians could take place like that– I go back home filled with hope!” It goes to show that even just meeting one person with a positive story can go a very long way. It made me realize the importance of our stories to be shared as often and as far and wide as possible. There are absolutely incredible peace-building activities taking place between Muslims and Christians around the world that will blow your mind. WOW! You cannot sit and listen to these stories and be deeply moved. You become a changed person. To see the love and courage in people’s eyes who do this kind of work and equip others to do so as well. 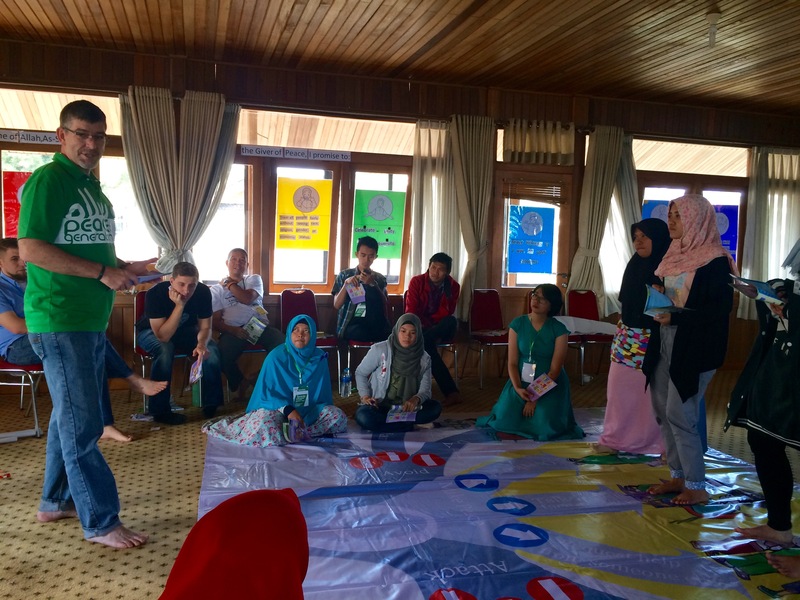 The highlight of my trip, therefore, were the days I spent in Bandung with 80 Muslims and Christians as we went through the Peace Generation Teacher Training. We were equipped to live out and teach the 12 Values of Peace. I was especially touched by everyone’s pro-active work in peace-building. For example, the young people organized a Peacetival in which a former terrorist who was part of the Bali bombings shared the stage with a victim of that terrorist act talking about forgiveness and sharing stories of peace. I learned so much from Peace Generation’s approach to end current conflict and prevent future ones. Here is my biggest take-away from my trip: Everywhere in the world people are either coming out of conflict and tension or increasingly moving towards it. Yet, there is a growing group of Muslims and Christians globally who are proactively working on peace. Let’s all join hands together and keep working towards this end!